PreNatal Nutrients – Looking for a high quality prenatal vitamin and supplement? Prenatal Nutrients by Pure Encapsulations provides pregnant women the necessary vitamins and nutrients to ensure proper child development. 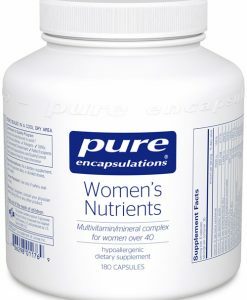 Pure Encapsulations PreNatal Nutrients provides vitamins recommended by doctors for pregnant and lactating women. 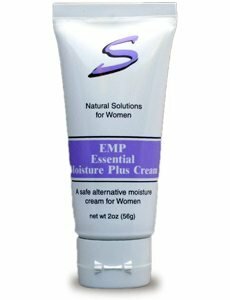 This specially formulated product includes core nutrients that are bioavailable and hypoallergenic vital for fetal development and lactating nutritional support. Preventing neural tube defects and supporting proper development of the brain and spinal cord are imperative, PreNatal Nutrients provides 1 mg (1,000 mcg) of folic acid, the highest amount indicated to be safe and effective. 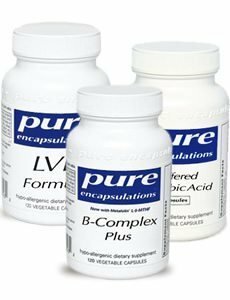 If you have questions about prenatal vitamin benefits, dosage and recommendations, please call one of our vitamin and supplement experts. 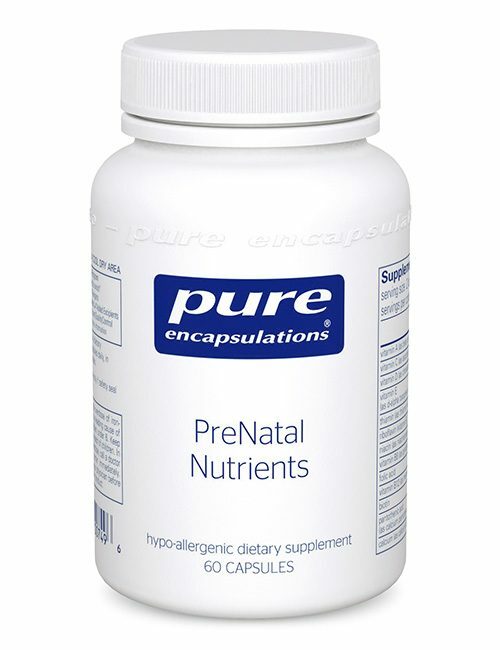 PreNatal Nutrients is a hypo-allergenic, highly bioavailable multi-vitamin and multi-mineral formula designed to promote maternal and fetal well-being. 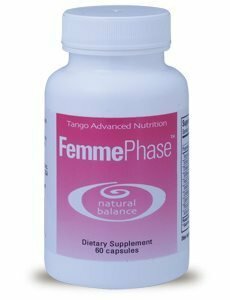 Support For Maternal And Fetal Health: PreNatal Nutrients provides the nutrients needed to help support maternal and fetal health in the doses that are consistent with the accepted scientific recommendations for pregnant and lactating women. 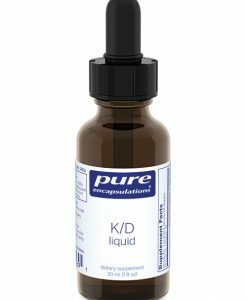 Furthermore, PreNatal Nutrients provides 1 mg of folic acid for healthy neural and cellular development of the fetal brain and spinal cord, helping to prevent neural tube defects. *† †Women who consume healthful diets with adequate folate may reduce their risk of having a child with birth defects of the brain or spinal cord. Folate intake should not exceed 250% of the DV (1,000 mcg). 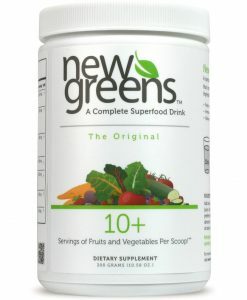 The nutrients found in PreNatal Nutrients are derived from the following: Beta carotene: Blakeslea trispora Lycopene: natural tomato concentrate Lutein: marigold flower extract Zeaxanthin: synthetic Vitamin C: corn dextrose fermentation Vitamin E: soybean Vitamin D3: cholesterol from wool fat (lanolin) Vitamin B1 (thiamine HCl): synthetic Vitamin B2 (riboflavin): corn dextrose fermentation Niacinamide: synthetic Vitamin B5 (calcium pantothenate): synthetic Vitamin B6 (pyridoxal HCl): synthetic Vitamin B12 (methylcobalamin): corn dextrose fermentation Folic acid: synthetic Biotin: synthetic Minerals: naturally derived from limestone Sources of the mineral chelates include: Aspartate: synthetic Citrate: corn dextrose fermentation Glycinate: synthetic Polynicotinate: synthetic Mixed carotenoid profile typically contains 4,800 mcg beta carotene, 133 mcg lycopene, 265 mcg lutein and 53 mcg zeaxanthin. There is no detectable GMO material in this product. Zeaxanthin is sourced from OPTISHARP™ brand. 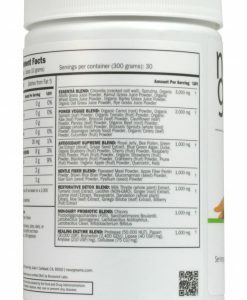 OPTISHARP is a trademark of DSM Nutritional Products, Inc. Recommendations 2 capsules per day, in divided doses, with meals. There are no known side effects or precautions associated with this formula. If pregnant or lactating, consult your physician before taking this product.